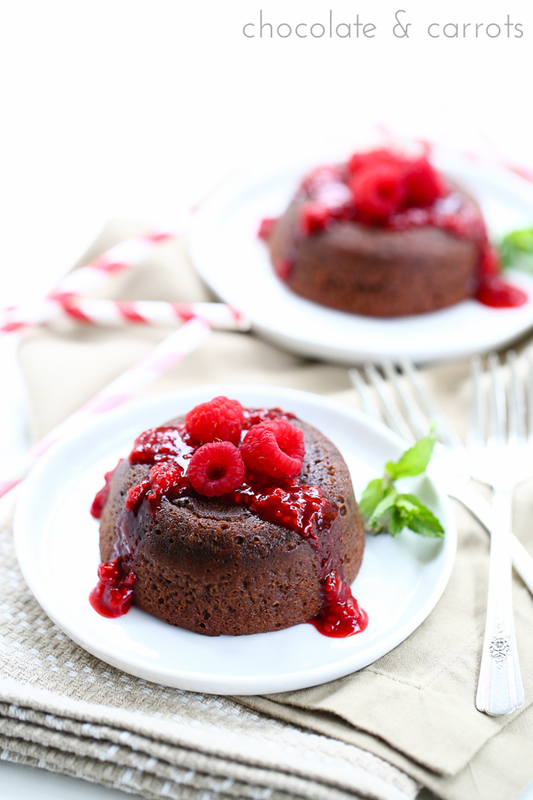 Spray four 7 ounce ramekins with baking cooking spray and place on a baking sheet. Set aside. In a 4 cup microwave safe bowl, microwave the chocolate and butter together for 1 minute. Stir until the chocolate is melted. Whisk in the raspberry and vanilla extracts. Whisk in the powdered sugar. Whisk in the eggs and egg yolk. Stir in the flour until just combined. Pour evenly into the ramekins, filling about 2/3rds full. Bake for 10-14 minutes until the sides are firm but the middle is soft. Meanwhile, microwave the frozen raspberries and honey for 30 seconds (may need longer) until the raspberries are thawed and fall apart when stirred. Stir in the 1/2 teaspoon raspberry extract. Set aside. Allow them to cool for 1 minute before flipping out onto a plate. Top with raspberry syrup, fresh raspberries and mint leaves as garnish. Note: Can be made in 6 ramekins instead of 4. I just made them big because we like chocolate….a lot. So let’s talk about these beautiful and delectable cakes. The flavor is impeccable. 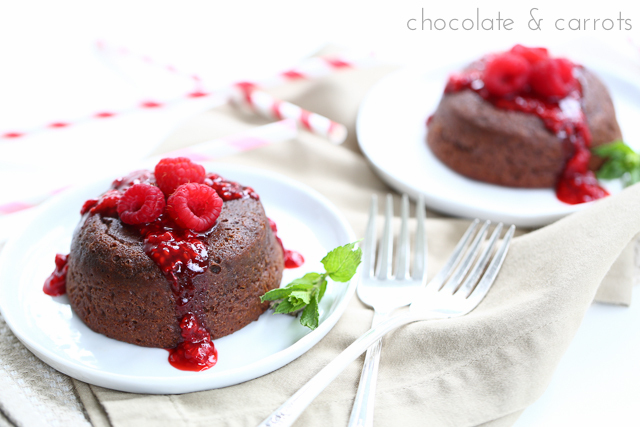 The rich chocolate is the perfect complement to the bright raspberry notes. 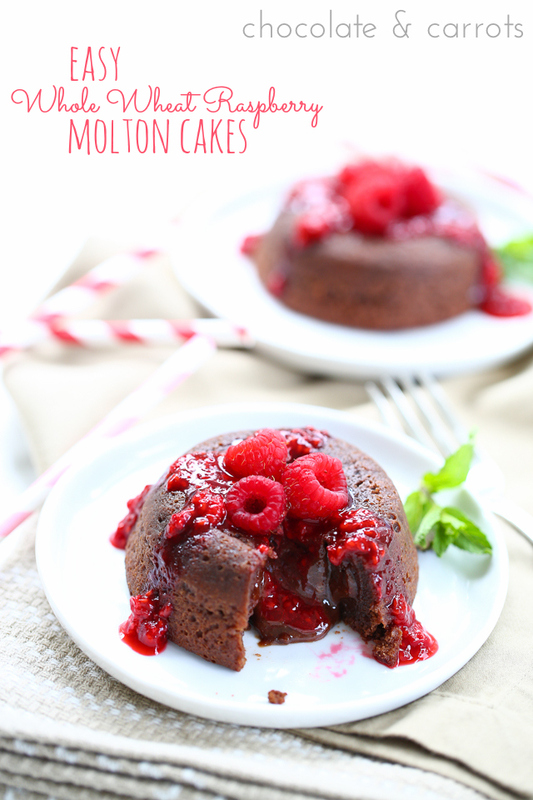 The raspberry flavor is both within the chocolate cake, gooey chocolate molten and in the raspberry topping. Basically, it’s delicious. It’s best served warm, right out of the oven. 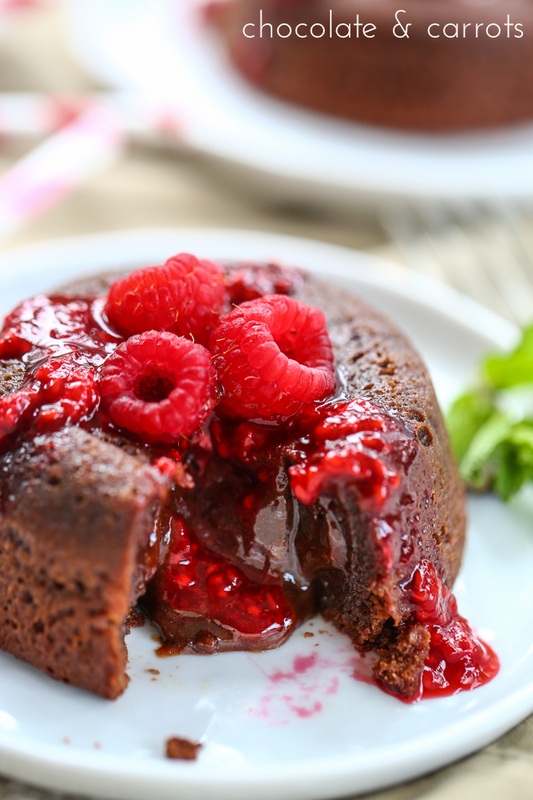 But if you’re like us and need to refrigerate your leftovers (if you’re lucky enough to have them), just pop the cakes in the microwave for just a few seconds until warm. 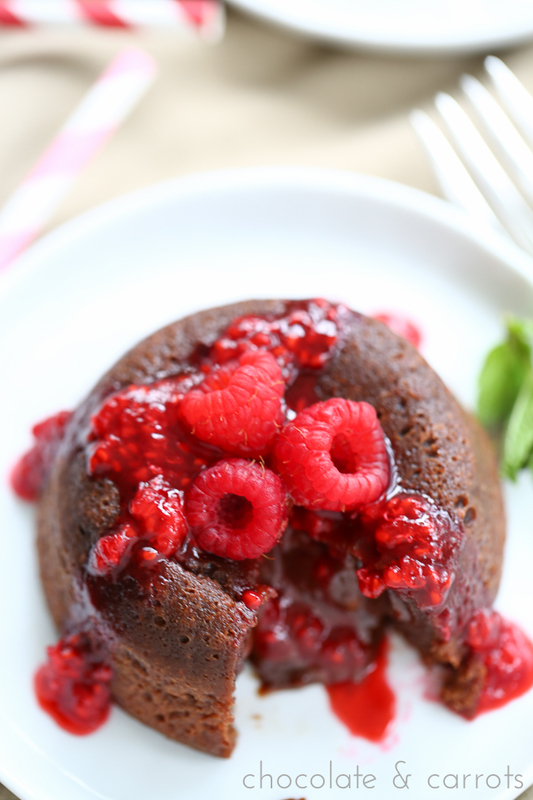 I can’t tell you how much the flavors of both the raspberry and vanilla take the chocolate flavor to the next level. As if there was another level beyond chocolate. The raspberry really shines through. You should definitely give these a go and make them for someone special.